Second-track gatherings of foreign policy experts to discuss sensitive issues are all the rage across Asia, but they are in danger of being run down by train-track diplomacy. Filipino President Rodrigo Duterte returned from his controversial trip to Beijing with tentative agreement for a Chinese-built rail project he had touted during his election campaign. Then Malaysia’s Prime Minister Najib Razak quickly followed up by securing a similar plan for a cross-country railway during a state visit. 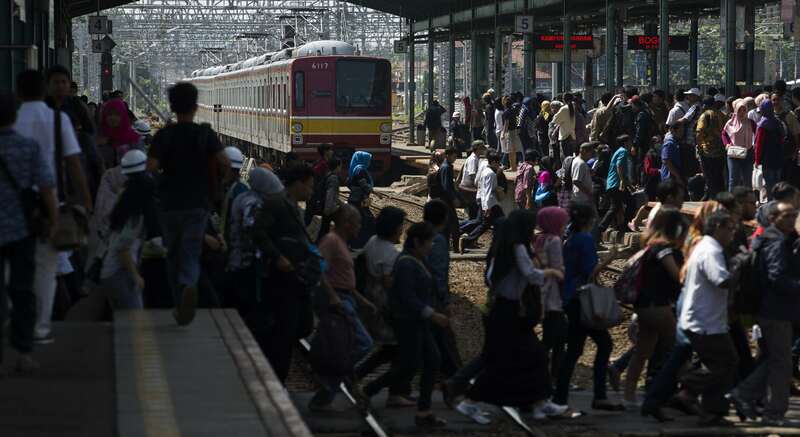 This comes on top of Chinese companies gazumping Japanese rivals to build the Jakarta-Bandung high speed rail line by promising an outcome by 2019 in time for President Joko Widodo’s re-election bid. Tension over this deal even led to the sacking of the less-than-enthusiastic transport minister earlier this year. Filipinos might be cynical about all this, since a 2005 Chinese plan to build a Luzon rail line under pro-China President Gloria Arroyo collapsed amid contract problems. But Duterte now has massive aid promises from China, Japan and the European Union to build different rail lines, which should inject some competitive tension into the process this time around. The idea of infrastructure as the new frontier of geopolitical competition has been underlined by the US Center for Strategic and International Studies launch of Reconnecting Asia, a project that tracks infrastructure construction across the region and places it in a strategic framework. CSIS senior advisor for Asian economics and Lowy Institute visitor Matthew Goodman says this development has the 'potential to reconfigure relationships, reroute flows of goods and people, and shift power within and between states'. This is a theme University of Delaware associate professor Alice Ba also took up in her recent keynote speech to the Sydney University Southeast Asia Centre ASEAN Forum. She says China has the financial clout through the One Belt One Road initiative to overwhelm ASEAN’s own infrastructure plans. But its approach remains attractive to smaller Asian nations because it has a regional vision for infrastructure when most Western aid projects have a more singular focus. The ANZ Bank has had one of the biggest Australian commercial footprints in Asia (up there with Qantas) so this week’s sale of much of its regional retail business to Singapore’s DBS has implications beyond the bank’s own balance sheet. This is the bank’s second high profile pull-back after the sale of the Indian-based Grindlays business in 2000, which still rankles with Indians. Under the Mike Smith-led expansion the bank has been a generous supporter of economic diplomacy through its thought leadership activity, ranging from the Asian business capability taskforce to its groundbreaking studies of PNG’s economy. Asialink, the Asia New Zealand Foundation and the Institute of Strategic & International Studies Malaysia have been holding their ASEAN Dialogue in Kuala Lumpur for nine years, but this year the strategic background was more uncertain than ever. There was general agreement that a US failure to ratify the Trans-Pacific Partnership (TPP) trade deal post-election would be a major loss of credibility. But on China’s new assertiveness there was only fragile consensus that ASEAN’s strategic ambiguity was a deliberate policy rather than the result of incoherence or spinelessness. The recent Singapore free trade agreement upgrade principles could be applied elsewhere, such as Malaysia. The review of the existing ASEAN-Australia-New Zealand trade agreement (ANZFTA) next year is critical to a more integrated regional economy. That representatives of the 12 countries should meet at a neutral location outside the region (and away from China’s eyes) to discuss common approaches to the South China Sea. That a regional submarine safety initiative would be a good way to explore security cooperation, given the increase in submarine activity in regional waters. Technical cooperation needs to move beyond aid programs, and perhaps more to industry groups with a commercial common interest. The growth of drug abuse/trafficking should be elevated as a regional security issue. Whatever the TPP’s fate, many of its regulatory principles should be easily worked into other trade agreements. If the anti-trade rhetoric from the US election campaign looks bad, the reality is the numbers seem to be tracking even worse. Data from the Netherlands Bureau of Economic Policy Analysis (which specialises in this area) show that global trade has been flat and even negative for much of this year with just a slight uptick in August. This is more severe than recently forecast by the International Monetary Fund and World Trade Organisation, which we reported here. This trend, and the aftermath of the US vote, will put more pressure on governments to demonstrate the value of trade deals which Trade Minister Steve Ciobo sought to do recently by slugging it out on BBC Hardtalk. KPMG has just made two useful contributions to this remedial action debate. It estimates that Australian goods exporters could miss $14 billion in export revenue over five years by not taking advantage of barrier reductions flowing mostly from the three recent agreements with China, Japan and South Korea. And at the global level a survey finds only 23% of respondents say they are taking full advantage of trade deals (although the figure is higher in Asia). Former Prime Minister Paul Keating once told his junior colleagues to make building personal contacts in Asia part of their political career development, and one of his proteges has gone back to basics. Shadow Treasurer Chris Bowen (also a former treasurer) demonstrated how much progress he has made trying to become the first Australian cabinet minister to speak Indonesian by showing off his part-time study progress in a recent speech in Jakarta. Two of Bowen’s colleagues, Luke Gosling and Stephen Jones, speak some Indonesian, and Shadow Foreign Minister Penny Wong can chime in with her native Malay. If they return to power, this new Labor linguistic faction raises interesting possibilities for dealing with the downturn in Indonesian study elsewhere in the community. Bowen says this is an 'important national imperative for Australia' and that’s why he is trying to, in effect, talk the talk. And to that end Bowen’s other plans are: to make Indonesia a top-ten trading partner within five years; to have an annual bilateral meeting of trade and finance ministers; and to establish an ASEAN studies centre in Australia. The old challenge of taking the Indonesia relationship beyond the now rewarmed diplomatic level made some interesting progress last month, with a visit by about two dozen young financial sector executives and regulators. The financial leaders program is a fast spin-off from a successful training program the Australia-Indonesia Centre has established with Indonesia’s Ministry of Foreign Affairs. With the Commonwealth Bank, QBE, IAG and (a shrinking) ANZ presence in Indonesia, financial services is a sector where Australian businesses have made some progress in the country. And the Indonesia Financial Services Authority (OJK), the program partner, is one of the country’s newer institutions with a key role in modernising the economy. The potential bilateral synergies from a training program in this sector are probably greater than with the long established foreign ministry. And the program probably fits better with the mercantilist diplomatic approach pursued by Indonesian President Joko Widodo, who addresses the Australian Parliament on Monday.